In Alabama Center of Paper and Bioresources Engineering, we have (A) the capability to perform a lab-scale processing of pulp and paper, (B) a professional-scale testing services, and (C) other important testing capabilities. 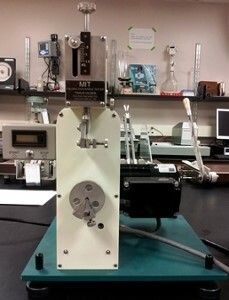 Tensile strength is the maximum tensile force developed in a test specimen before rupture on a tensile tester carried to rupture under prescribed conditions. Tensile Tester "PARAM XLW(EC)" from LABTHINK is a vertical single-column tensile tester designed for testing of paper and low elongation films and foil. constant rate under a rubber diaphragm until sample rupture. 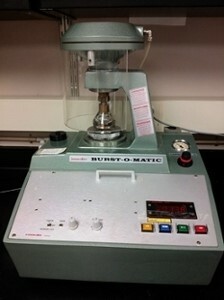 The L&W Burst-o-matic is designed to measure the bursting strength of sheet materials. The energy consumed to tear the test sample (usually 4 plies of the sheet material) a certain distance is used to calculate the average tearing force. 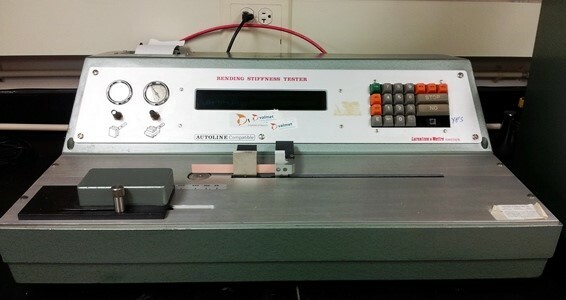 The L&W Tearing Tester measures the tearing strength of paper, fabric, plastic foil, ect. 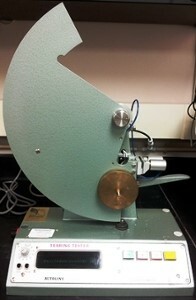 The tearing energy is measured through positional change of machine’s pendulum. Output results is the paper tearing strength in force units standard or metric (usually pounds). A strip of sheet (paper) under a standard tension is subjected to double folding oscillations until break. The logarithm to the base 10 of the number of double folds is considered as “Folding Endurance”. It measures the ability of a sheet of material (paper) to withstand repeated folding. It is also useful for indicating the deterioration of material upon aging. A strip of sheet (paper) is clamped in two pair of clamps 0.7 mm apart. moving towards each other, sample is compressed in the edge direction. The maximum force causing failure is measured and given in pound. 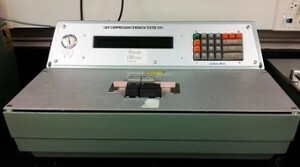 The L&W Compression Strength Tester uses the STFI method of testing for edgewise compression strength of containerboard in the range of 100 – 400 g/m2. 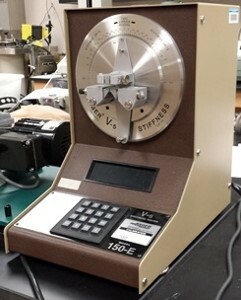 This instrument measures the bending moment required to deflect the free end of a 1.5 in wide vertically clamped specimen 15º from its center line when the load is applied 2 in. away from the clamp. The resistance to bending is calculated from the bending moment and given in Taber units. 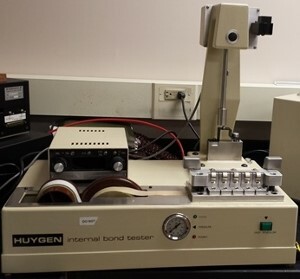 The Huygen Internal Bond Tester is designed to measure rapid “Z” directional ruptures of paper and paperboard samples. The unit uses Scott and American Sisal craft specimen technique. 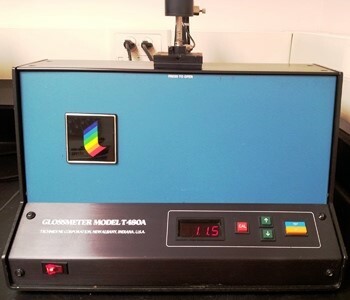 The TSO Tester is an ultrasonic instrument for measuring Tensile Stiffness Index or Tensile Stiffness Orientation properties on sheets in machine and cross directions sheet (paper) samples. 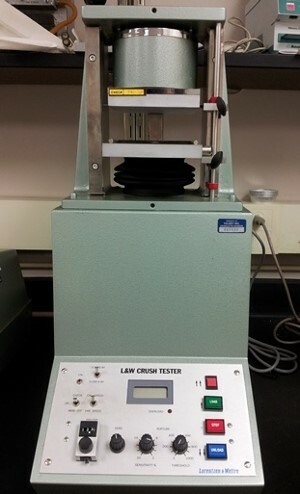 The L&W Crush Tester is used for testing liner, fluting, corrugated fiberboard, packaging, and similar products. Gurley is the standard instrument for measuring porosity, air permeability, or the air resistance of paper products. 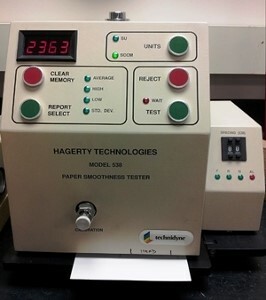 The Hagerty Paper Smoothness Tester tests the surface smoothness of paper especially coated. This method is a measurement of the air flow between the specimen (backed by flat glass on the bottom side) and two pressurized, concentric annular lands that are impressed into the sample from the top side. The rate of air flow is related to the surface roughness of paper or paperboard. Its primary application is for coated papers but the machine may also be used on uncoated papers, most ink films, and paper or paperboard. 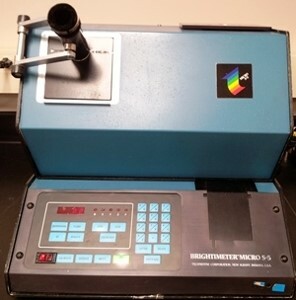 The Brightimeter Micro S5 measures brightness, opacity, color, and fluorescence. The Electronic Micro Gauge measures specimen thickness within the 0 – 3 mm range. In our wet processing and testing laboratory, we have a whole line of machines from wood chip digesters, pulpers, repulpers, mixers, to handsheet paper making. 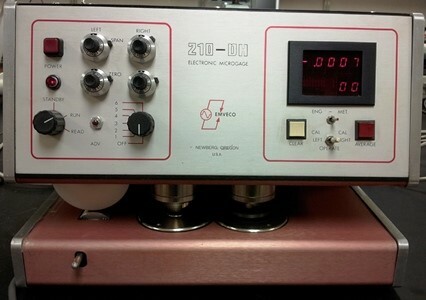 Recently, we added to our lab a pilot scale Microfluidizer M-110EH-30. 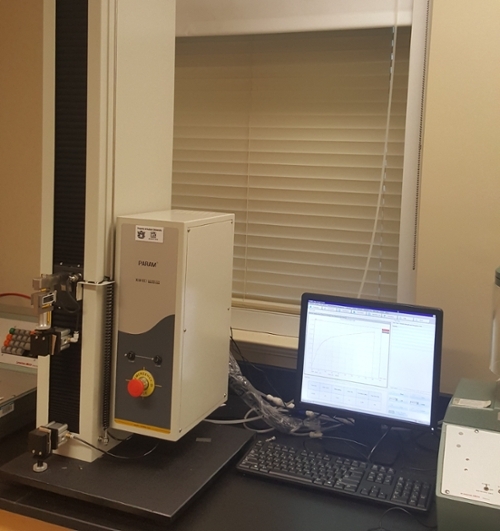 This machine adds to our capabilities to produce NFC (Nanofibrillated Cellulose) or MFC (Microfibrillated Cellulose) fibers that can be used in many applications. 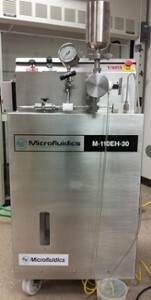 The M-110EH-30 Microfluidizer Processor uses interchangeable chambers of varying geometries to process a range of fluids such as fiber suspensions in multiple passes to break the fibers down to a micro or nano scale. 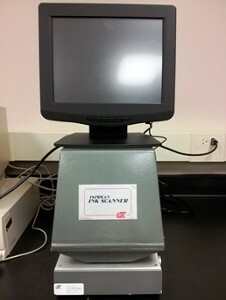 The Paprican Ink Scanner is a high magnification image analyzer that rapidly and accurately quantifies microscopic residual ink specks of 8 um and larger during and after de-inking of recycled fiber pulps. Speck size, count and distribution are obtained.